Breathing Space Family Yoga classes are structured so both parents and children can enjoy themselves while moving in a supportive, non-competitive environment. 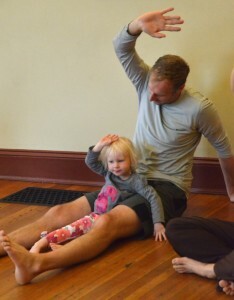 While many of the poses will look familiar to adult yogis, a kids class flows very differently than an adult yoga class. What is Family Yoga & Mindfulness Class Like? We incorporate lots of songs and games centered around movement and mindfulness. There’s lots of emphasis on social interaction. We use many props never found in an adult class: hula hoops, balloons, scarfs, crayons, and more. Many classes incorporate story telling or books. life events and places – holidays, travel, a visit to the zoo, jungle safari, desert adventure. Family classes are structured very much like an age-appropriate kids class with more emphasis on partner poses and connections between parent and child. Parents should plan to fully participate in family classes. One adult must be present, up to two adults are welcome on weekly basis, and the same adult need not be present every time. Looking for a class your child can take solo? Check out kids and teen yoga. Most of our kids and family classes run in semesters, meaning students sign up consecutive weeks of classes (Read more). Classes described as Playshops or Pop-ups do not require a multi-week commitment. If students must miss series a class, they are welcome to do makeups in any other appropriate class on our schedule. Alternatively, family members are welcome to take a makeup class in any appropriate series. See attendance and makeup policies. There are no makeups for playshops/pop-up classes. See refund policies.